The updated Subaru Outback Lineartronic 2.5i is going on sale for the 182-plate change with its prices held at those of the outgoing diesel model - meaning the Japanese crossover estate will start from €46,995 on these shores. 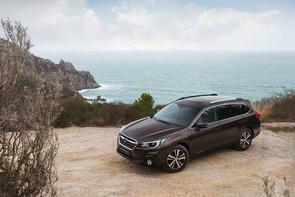 Revised and available in SE (€46,995) or SE Premium (€49,995) grades, the 2018 Outback has had 'a significant upgrade in technology and trim,' according to its maker. Starting on the exterior, there's a redesigned hexagonal radiator grille with Subaru's 'wing' aesthetic, plus modifications to the headlights, bumper and door mirrors. There's also a new bit of equipment incorporated into the Outback's nose, which is the front-view camera - it's now below the marque's Pleiades constellation logo. This camera monitors a 180-degree area in front of the car that would normally be in the driver's blind spot, with the results displayed on the Subaru's in-cabin touchscreen. Further safety equipment comes in the form of a side-view camera at the base of the passenger door mirror, Lane Keep Assist (bolstering the existing EyeSight drive assistance technology suite) and Steering-Responsive Headlights. Inside, the Outback receives new decorative gloss-black panels and silver surrounds to improve the interior ambience, while the touchscreen grows in size from seven to eight inches. Under the bonnet, a naturally-aspirated 2.5-litre 'boxer' four-cylinder petrol engine is employed, which is installed low down and further back than a conventional 'upright' engine to give the Subaru a lower centre-of-gravity and increased passenger safety; in the event of a front-end accident, it is designed to submarine beneath the passenger compartment. The 2.5-litre 'FB25' engine delivers 175hp at 5,800rpm and 235Nm at 4,000rpm.